This article is about the corporation. For people named Nikon, see Nikon (disambiguation). Nikon Corporation (株式会社ニコン, Kabushiki-gaisha Nikon) (UK: /ˈnɪkɒn/ or US: /ˈnaɪkɒn/; listen (help·info)[ɲikoɴ]), also known just as Nikon, is a Japanese multinational corporation headquartered in Tokyo, Japan, specializing in optics and imaging products. Nikon's products include cameras, camera lenses, binoculars, microscopes, ophthalmic lenses, measurement instruments, rifle scopes, spotting scopes, and the steppers used in the photolithography steps of semiconductor fabrication, of which it is the world's second largest manufacturer. The company is the eighth-largest chip equipment maker as reported in 2017. The companies held by Nikon form the Nikon Group. 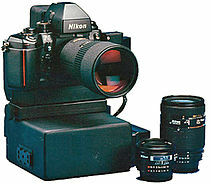 Among its products are Nikkor imaging lenses (for F-mount cameras, large format photography, photographic enlargers, and other applications), the Nikon F-series of 35 mm film SLR cameras, the Nikon D-series of digital SLR cameras, the Coolpix series of compact digital cameras, and the Nikonos series of underwater film cameras. Nikon's main competitors in camera and lens manufacturing include Canon, Sony, Fujifilm, Panasonic, Pentax, and Olympus. Founded on July 25, 1917 as Nippon Kōgaku Kōgyō Kabushikigaisha (日本光学工業株式会社 "Japan Optical Industries Co., Ltd."), the company was renamed to Nikon Corporation, after its cameras, in 1988. Nikon is a member of the Mitsubishi group of companies (keiretsu). Nikon Corporation was established on 25 July 1917 when three leading optical manufacturers merged to form a comprehensive, fully integrated optical company known as Nippon Kōgaku Tōkyō K.K. Over the next sixty years, this growing company became a manufacturer of optical lenses (including those for the first Canon cameras) and equipment used in cameras, binoculars, microscopes and inspection equipment. During World War II the company operated thirty factories with 2,000 employees, manufacturing binoculars, lenses, bomb sights, and periscopes for the Japanese military. After the war Nippon Kōgaku reverted to producing its civilian product range in a single factory. In 1948, the first Nikon-branded camera was released, the Nikon I. Nikon lenses were popularised by the American photojournalist David Douglas Duncan. Duncan was working in Tokyo when the Korean War began. Duncan had met a young Japanese photographer, Jun Miki, who introduced Duncan to Nikon lenses. From July 1950 to January 1951, Duncan covered the Korean War. Fitting Nikon optics (especially the NIKKOR-P.C 1:2 f=8,5 cm) to his Leica rangefinder cameras produced high contrast negatives with very sharp resolution at the centre field. Nikko parent company brand, from which the Nikkor brand evolved. Founded in 1917 as Nippon Kōgaku Kōgyō Kabushikigaisha (日本光学工業株式会社 "Japan Optical Industries Corporation"), the company was renamed Nikon Corporation, after its cameras, in 1988. The name Nikon, which dates from 1946, sounds like a merging of Nippon Kōgaku (日本光学: "Japan Optical") and Zeiss's brand Ikon. This would cause some early problems in Germany as Zeiss complained that Nikon violated its trademarked camera. From 1963 to 1968 the Nikon F in particular was therefore labeled 'Nikkor'. The Nikkor brand was introduced in 1932, a westernised rendering of an earlier version Nikkō (日光), an abbreviation of the company's original full name (Nikkō coincidentally means "sunlight" and is the name of a Japanese town.). Nikkor is the Nikon brand name for its lenses. Another early brand used on microscopes was Joico, an abbreviation of "Japan Optical Industries Co". Expeed is the brand Nikon uses for its image processors since 2007. The Nikon SP and other 1950s and 1960s rangefinder cameras competed directly with models from Leica and Zeiss. However, the company quickly ceased developing its rangefinder line to focus its efforts on the Nikon F single-lens reflex line of cameras, which was successful upon its introduction in 1959. For nearly 30 years, Nikon's F-series SLRs were the most widely used small-format cameras among professional photographers, as well as by the U.S. space program. Nikon popularized many features in professional SLR photography, such as the modular camera system with interchangeable lenses, viewfinders, motor drives, and data backs; integrated light metering and lens indexing; electronic strobe flashguns instead of expendable flashbulbs; electronic shutter control; evaluative multi-zone "matrix" metering; and built-in motorized film advance. However, as auto focus SLRs became available from Minolta and others in the mid-1980s, Nikon's line of manual-focus cameras began to seem out of date. Despite introducing one of the first autofocus models, the slow and bulky F3AF, the company's determination to maintain lens compatibility with its F-mount prevented rapid advances in autofocus technology. Canon introduced a new type of lens-camera interface with its entirely electronic Canon EOS cameras and Canon EF lens mount in 1987. The much faster lens performance permitted by Canon's electronic focusing and aperture control prompted many professional photographers (especially in sports and news) to switch to the Canon system through the 1990s. Nikon NASA F4 front view with DA-20 action finder, Electronics Box and lenses. Launched September 1991 on board the Space Shuttle Discovery, mission STS-48. Nikon created some of the first digital SLRs (DSLRs, Nikon NASA F4) for NASA, used in the Space Shuttle since 1991. After a 1990s partnership with Kodak to produce digital SLR cameras based on existing Nikon film bodies, Nikon released the Nikon D1 SLR under its own name in 1999. Although it used an APS-C-size light sensor only 2/3 the size of a 35 mm film frame (later called a "DX sensor"), the D1 was among the first digital cameras to have sufficient image quality and a low enough price for some professionals (particularly photojournalists and sports photographers) to use it as a replacement for a film SLR. The company also has a Coolpix line which grew as consumer digital photography became increasingly prevalent through the early 2000s. Through the mid-2000s, Nikon's line of professional and enthusiast DSLRs and lenses including their back compatible AF-S lens line remained in second place behind Canon in SLR camera sales, and Canon had several years' lead in producing professional DSLRs with light sensors as large as traditional 35 mm film frames. All Nikon DSLRs from 1999 to 2007, by contrast, used the smaller DX size sensor. Then, 2005 management changes at Nikon led to new camera designs such as the full-frame Nikon D3 in late 2007, the Nikon D700 a few months later, and mid-range SLRs. Nikon regained much of its reputation among professional and amateur enthusiast photographers as a leading innovator in the field, especially because of the speed, ergonomics, and low-light performance of its latest models. [unreliable source?] The mid-range Nikon D90, introduced in 2008, was also the first SLR camera to record video. Since then video mode has been introduced to many more of the Nikon DSLR cameras including the Nikon D3S, Nikon D7000, Nikon D5100, Nikon D3100, Nikon D3200 and Nikon D5100. More recently, Nikon has released a photograph and video editing suite called ViewNX to browse, edit, merge and share images and videos. Once Nikon introduced affordable consumer-level DSLRs such as the Nikon D70 in the mid-2000s, sales of its consumer and professional film cameras fell rapidly, following the general trend in the industry. In January 2006, Nikon announced it would stop making most of its film camera models and all of its large format lenses, and focus on digital models. Nevertheless, Nikon is the only major camera manufacturer still making film SLRs. The remaining model is the professional Nikon F6 with the last amateur model, FM10, having been discontinued. Although few models were introduced, Nikon made movie cameras as well. The R10 and R8 SUPER ZOOM Super 8 models (introduced in 1973) were the top of the line and last attempt for the amateur movie field. The cameras had a special gate and claw system to improve image steadiness and overcome a major drawback of Super 8 cartridge design. The R10 model has a high speed 10X macro zoom lens. Contrary to other brands, Nikon never attempted to offer projectors or their accessories. Nikon has shifted much of its manufacturing facilities to Thailand, with some production (especially of Coolpix cameras and some low-end lenses) in Indonesia. The company constructed a factory in Ayuthaya north of Bangkok in Thailand in 1991. By the year 2000, it had 2,000 employees. Steady growth over the next few years and an increase of floor space from the original 19,400 square meters (208,827 square feet) to 46,200 square meters (497,300 square feet) enabled the factory to produce a wider range of Nikon products. By 2004, it had more than 8,000 workers. The range of the products produced at Nikon Thailand include plastic molding, optical parts, painting, printing, metal processing, plating, spherical lens process, aspherical lens process, prism process, electrical and electronic mounting process, silent wave motor and autofocus unit production. As of 2009, all of Nikon's Nikon DX format DSLR cameras and the D600, a prosumer FX camera, are produced in Thailand, while their professional and semi-professional Nikon FX format (full frame) cameras (D700, D3, D3S, D3X, D4, D800 and the retro-styled Df) are built in Japan, in the city of Sendai. The Thai facility also produces most of Nikon's digital "DX" zoom lenses, as well as numerous other lenses in the Nikkor line. In Japan, Nikon runs the Nikon Salon exhibition spaces, runs the Nikkor Club for amateur photographers (to whom it distributes the series of Nikon Salon books), and arranges the Ina Nobuo Award, Miki Jun Award and Miki Jun Inspiration Awards. As of November 19, 2013, Nikon is the "Official Camera" of Walt Disney World Resort and Disneyland Resort. Nikon is the official co-sponsor of Galatasaray SK Football Team. In 2014 Nikon sponsored the Copa Sadia do Brasil 2014 and the AFC Champions League. In 1999, Nikon and Essilor have signed a Memorandum of understanding to form a global strategic alliance in corrective lenses by forming a 50/50 joint venture in Japan to be called Nikon-Essilor Co. Ltd. The main purpose of the joint venture is to further strengthen the corrective lens business of both companies. This will be achieved through the integrated strengths of Nikon's strong brand backed up by advanced optical technology and strong sales network in Japanese market, coupled with the high productivity and worldwide marketing and sales network of Essilor, the world leader in this industry. Nikon-Essilor Co. Ltd. started its business in January 2000, responsible for research, development, production and sales mainly for ophthalmic optics. The company developed the first lithography equipment from Japan which is essential for semiconductor manufacturing. Devices from Nikon enjoyed high demand from global chipmakers, including Intel, and Nikon became the world's leading producer of semiconductor lithography systems until the 1990s. In recent years, ASML, a Dutch company, has grabbed over 80 percent of the global market in 2015 by adopting an open innovation method of product development. Nikon saw a sharp drop in its market share from less than 40 percent in early 2000s. The company has been losing an estimated ¥17 billion a year in its precision instruments unit. Furthermore, revenue from its camera business has dropped 30% in three years prior to fiscal 2015. In 2013, it forecast the first drop in sales from interchangeable lens cameras since Nikon's first digital SLR in 1999. The company's net profit has fallen from a peak of ¥75.4 billion (fiscal 2007) to ¥18.2 billion for fiscal 2015. Nikon plans to reassign over 1,500 employees resulting in job cuts of 1,000 by 2017 as the company shifts focus to medical and industrial devices business for growth. Wikimedia Commons has media related to Nikon cameras. In January 2006 Nikon announced the discontinuation of all but two models of its film cameras, focusing its efforts on the digital camera market. It continues to sell the fully manual FM10, and still offers the high-end fully automatic F6. Nikon has also committed to service all the film cameras for a period of ten years after production ceases. Between 1983 and the early 2000s a broad range of compact cameras were made by Nikon. Nikon first started by naming the cameras with a series name (like the L35/L135-series, the RF/RD-series, the W35-series, the EF or the AW-series). In later production cycles, the cameras were double branded with a series-name on the one and a sales name on the other hand. Sales names were for example Zoom-Touch for cameras with a wide zoom range, Lite-Touch for ultra compact models, Fun-Touch for easy to use cameras and Sport-Touch for splash water resistance. After the late 1990s, Nikon dropped the series names and continued only with the sales name. Nikon's APS-cameras were all named Nuvis. The cameras came in all price ranges from entry-level fixed-lens-cameras to the top model Nikon 35Ti and 28Ti with titanium body and 3D-Matrix-Metering. Nikon's raw image format is NEF, for Nikon Electronic File. The "DSCN" prefix for image files stands for "Digital Still Camera - Nikon." The Nikon Coolpix series are digital compact cameras produced in many variants: Superzoom, bridge, travel-zoom, miniature compact and waterproof/rugged cameras. The top compact cameras are several "Performance" series indicated by a "P...". Coolpix series since 2008 listed. Nikon Expeed, a system on a chip used as image processor in all Nikon DSLRs since 2007 and some digital compact cameras. Along with the D750 and D500 above, these are the only Nikon DSLR's with the articulated (tilt-and-swivel) display. The Nikon F-mount is a type of interchangeable lens mount developed by Nikon for its 35 mm Single-lens reflex cameras. The F-mount was first introduced on the Nikon F camera in 1959. Nikon uses the term Speedlight for its electronic flashes. Recent models include the SB-R200, SB-300, SB-400, SB-600, SB-700, SB-800, SB-900, SB-910 and R1C1. Nikon's digital capture line also includes a successful range of dedicated scanners for a variety of formats, including Advanced Photo System (IX240), 35 mm, and 60 mm film. (1988) LS-3500 (4096x6144, 4000 dpi, 30 bits per pixel) HP-IB (requires a third-party NuBus card; intended for Mac platforms, for which there is a Photoshop plug-in). (1992) Coolscan LS-10 (2700 dpi) SCSI. First to be named "Coolscan" to denote LED illumination. (1994) LS-3510AF (4096x6144, 4000 dpi, 30 bits per pixel) Auto-focus SCSI (usually employed on Mac platforms with a Photoshop plug-in; TWAIN is available for PC platforms). (1995) LS-4500AF (4 x 5 inch and 120/220 formats, 1000x2000 dpi, 35mm format 3000x3000). 12bit A/D. SCSI. Fitted with auto-focus lens. Nikon introduced its first scanner, the Nikon LS-3500 with a maximum resolution of 4096 x 6144 pixels, in 1988. Prior to the development of 'cool' LED lighting this scanner used a halogen lamp (hence the name 'Coolscan' for the following models). The resolution of the following LED based Coolscan model didn't increase but the price was significantly lower. Colour depth, scan quality, imaging and hardware functionality as well as scanning speed was gradually improved with each following model. The final 'top of the line' 35mm Coolscan LS-5000 ED was a device capable of archiving greater numbers of slides; 50 framed slides or 40 images on film roll. It could scan all these in one batch using special adapters. A single maximum resolution scan was performed in no more than 20 seconds as long as no post-processing was also performed. With the launch of the Coolscan 9000 ED Nikon introduced its most up-to-date film scanner which, like the Minolta Dimage scanners were the only film scanners that, due to a special version of Digital ICE, were able to scan Kodachrome film reliably both dust and scratch free. In late 2007 much of the software's code had to be rewritten to make it Mac OS 10.5 compatible. Nikon announced it would discontinue supporting its Nikon Scan software for the Macintosh as well as for Windows Vista 64-bit. Third-party software solutions like SilverFast or Vuescan provide alternatives to the official Nikon drivers and scanning software, and maintain updated drivers for most current operating systems. Between 1994 and 1996 Nikon developed three flatbed scanner models named Scantouch, which couldn't keep up with competitive flatbed products and were hence discontinued to allow Nikon to focus on its dedicated film scanners. Nikon Metrology, a division of Nikon, produces hardware and software products for 2D & 3D measurement from nano to large scale measurement volumes. Products include Optical Laser Probes, X-ray computed tomography, Coordinate-measuring machine (CMM),Laser Radar Systems (LR), Microscopes, Portable CMMs, Large Volume Metrology, Motion Measurement and Adaptive Robotic Controls, Semiconductor Systems, Metrology Software including CMM-Manager, CAMIO Studio, Inspect-X, Focus, and Automeasure. Measurements are performed using tactile and non-contact probes, measurement data is collected in software and processed for comparison to nominal CAD (Computer-aided design) or part specification or for recreating / reverse engineering physical work pieces. The origins of Nikon go back to 1917 when three Jananese optical manufacturers joined to form Nippon Kogaku KK ('Japan Optics'). In 1925 the microscope having revolving nosepiece and interchangeable objectives was produced. Significant growth for the microscopy division occurs over the next 50 years as Nikon pioneers development of polarising and stereo microscopes along with new products for measuring and inspection (Metrology) markets. These new products include devices targeted for industrial use such as optical comparators, autocollimators, profile projector and automated vision based systems. Continued effort through the next three decades yield the release of products including the Optiphot and Labophot microscopes, Diaphot microscope, the Eclipse range of infinity optics, and finally the DS camera series and the Coolscope with the advent of digital sensors. With the acquisition of Metris in 2009 the Nikon Metrology division was born. Nikon Metrology products include a full range of both 2D & 3D, optical, tactile, non-contact, and X-Ray Metrology solutions ranging from nanometer resolution on microscopic samples to μm resolution in volumes large enough to house a commercial airliner. Application Software - several options available depending on specific application and hardware. Nikon also manufactures ophthalmic equipment, loupes, monoculars, binocular telescopes, microscopes, laser rangefinders, cameras for microscopy, optical and video-based measurement equipment, scanners and steppers for the manufacture of integrated circuits and liquid crystal displays, and semiconductor device inspection equipment. The steppers and scanners represent about one third of the income for the company as of 2008. Nikon has also manufactured eyeglasses, sunglasses, and glasses frames, under the brands Nikon, Niji, Nobili-Ti, Presio, and Velociti VTI. Singer Paul Simon referenced Nikon Cameras in his 1973 song "Kodachrome." Dexter Morgan, main character of the Showtime series Dexter, can be seen using a Nikon camera throughout the show. In the movie Hackers, the character "Lord Nikon" got his alias because of his photographic memory. In the lyrics to the Oak Ridge Boys song "American Made", a reference to Nikon Cameras is made ( "I got a Nikon camera, a Sony color tv"). In the movie "The French Connection", the drug dealer gives his girlfriend a Nikon F camera. In the film "The Most Beautiful" by Akira Kurosawa, the "East Asian Optical Company" scenes were filmed at the Nippon Kogaku factory in Totsuka, Yokohama, Japan. Nikon was ranked 134th among India's most trusted brands according to the Brand Trust Report 2012, a study conducted by Trust Research Advisory. In the Brand Trust Report 2013, Nikon was ranked 28th among India's most trusted brands and subsequently, according to the Brand Trust Report 2014, Nikon was ranked 178th among India's most trusted brands. ^ a b c d "Annual Report 2015" (PDF). Nikon corporation. Retrieved 2015-10-03. ^ "Analyst: Top IC suppliers remain largely unchanged 2007". Solid State Technology. Electro IQ. 2008-05-18. Archived from the original on 2013-03-20. Retrieved 2010-02-05. ^ "Nikon files patent case against ASML, Carl Zeiss over lithography tech". Reuters. 24 Apr 2017. Retrieved 24 April 2017. ^ "Nikon Group Companies". Nikon Corporation. Retrieved 2010-02-05. ^ "Nikon Company Profile". mitsubishi.com committee. Retrieved 2011-01-27. ^ "Nikon Camera History". Archived from the original on 2010-02-04. Retrieved 2010-02-05. ^ "David Douglas Duncan". Harry Ransom Center. The University of Texas at Austin. Retrieved 2010-02-05. ^ In German: Peter Braczko, Nikon Faszination, Geschichte – Technik – Mythos von 1917 bis heute, Hückelhoven 1992, ISBN 3-88984-047-7, S. 27ff und Tafel 2. ^ Kouichi Ohsita (2007-09-30). "The Thousand and One Nights, Tale 36 : Nikkor P.C 8.5 cm f/2". NIKKOR Club Quarterly magazine. Nikon Corporation. Archived from the original on 2010-03-29. Retrieved 2010-02-05. ^ "The 75th Anniversary of NIKKOR Lenses". Nikon Corporation. 18 March 2008. Archived from the original on 7 April 2008. Retrieved 5 February 2010. ^ "Corporate History". Nikon Corporation. Archived from the original on 2010-01-14. Retrieved 2010-02-05. ^ "Nikon | Imaging Products | Debut of Nikon F". imaging.nikon.com. Retrieved 2018-03-13. ^ "Canon EOS Resources: SLR Cameras - Modern Classic SLR Series". Photography in Malaysia. Retrieved 2010-02-05. ^ "NASA F4 Electronic Still Camera". 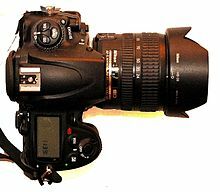 NikonWeb.com. Retrieved 2010-02-05. ^ Ken Rockwell. "Nikon vs. Canon". Kenrockwell.com. Retrieved 2010-02-05. ^ "Some Initial Thoughts on The Nikon D700". Luminous Landscape. 2008-07-02. Retrieved 2010-02-05. ^ "Nikon D90 plus hands-on preview". Digital Photography Review. 2008-08-27. Retrieved 2010-02-05. ^ "Digital SLR Camera Nikon D90". Nikon Corporation. 2008-08-27. Archived from the original on 2010-01-31. Retrieved 2010-02-05. ^ "Nikon Products D3S". Nikon Canada. ^ "Nikon Products D7000". Nikon Canada. ^ "Nikon Products D5100". Nikon Canada. ^ "Nikon Products D3100". Nikon Canada. ^ "Nikon Products D3200". Nikon Canada. ^ "Nikon - Imaging Products - ViewNX 2". Nikon Corpation. Retrieved 30 December 2016. ^ "Nikon releases ViewNX 2 software". DP Review. Retrieved 30 December 2016. ^ "Nikon Strengthens Digital Focus for 2006". Nikon Corporation. 2006-02-14. Archived from the original on August 26, 2014. Retrieved 2010-02-05. ^ Inc., Nikon. "Nikon And Walt Disney World And Disneyland Resorts Team Up To Capture Magical Photo Moments". Retrieved 30 December 2016. ^ "NIKON BECOMES THE OFFICIAL SPONSOR OF GALATASARAY FOOTBALL TEAM". Nikon. Retrieved 15 October 2012. ^ Çelik, Hakan. "Nikon ve Galatasaray". Posta Newspaper. Retrieved 20 October 2012. ^ "Nikon - Corporate Information - Sponsorship Activities". Archived from the original on 13 November 2012. Retrieved 30 December 2016. ^ "Nikon - News - Nikon, Japan and Essilor, France agree to establish a joint company". Archived from the original on 14 March 2013. Retrieved 30 December 2016. ^ "ニコン・エシロール｜ホーム". Retrieved 30 December 2016. ^ a b "Nikon drops sales forecast as high-end camera market stalls". Reuters. Nov 7, 2013. Retrieved 2 January 2017. ^ a b Nitta, Yuichi; Oshikiri, Tomoyoshi (Nov 9, 2016). "Nikon's independent streak led to job cuts". Nikkei Asian Review. Retrieved 2 January 2017. ^ a b c "Nikon to cut 1,000 jobs in Japan". Nikkei Asian Review. Nov 8, 2016. Retrieved 2 January 2017. ^ "Nikon to "re-assign" 1,550 employees in Japan, total headcount will be reduced by 1,000 *UPDATED* (Nov 8, 2016)". NikonRumors.com. Retrieved 2 January 2017. ^ "Nikon to focus on digital cameras". BBC News. 2006-01-12. Retrieved 2010-02-05. ^ Nikon | Imaging Products | Film SLR Cameras. Imaging.nikon.com. Retrieved on 2013-07-26. ^ デジタル・フィルム一眼レフカメラ | ニコンイメージング. Nikon-image.com. Retrieved on 2013-07-26. ^ "Reshaping Nikon's Film Camera Assortment". Nikon USA. 2006-01-11. Retrieved 2010-02-05. ^ "Nikon PRONEA 600i (PRONEA 6i)". Nikon Corporation. Retrieved 2010-11-08. ^ "Nikon PRONEA S". Nikon Corporation. Retrieved 2010-11-08. ^ a b Nikon | Imaging Products | Evolution of NIKONOS. Imaging.nikon.com. Retrieved on 2013-07-26. ^ "A Short History of Nippon Kogaku Japan". Nikon Historical Society Online. Archived from the original on 2010-03-02. Retrieved 2010-02-05. ^ "Nikon M Unsynced". 26 November 2003. Retrieved 2010-02-05. ^ "Nikon S". 26 November 2003. Retrieved 2010-02-05. ^ Karen Nakamura (26 November 2003). "Classic Cameras - Nikon S2". Retrieved 2010-02-05. ^ "Nikon Rangefinder SP". 26 November 2003. Retrieved 2010-02-05. ^ "Nippon Kogaku Nikon S3 Camera". 17 June 2001. Retrieved 2010-02-05. ^ "Nikon S4 Rangefinder". 26 November 2003. Retrieved 2010-02-05. ^ "Nikon S3M". 26 November 2003. Retrieved 2010-02-05. ^ "Nikon S3 2000 Rangefinder". 5 April 2009. Retrieved 2010-02-05. ^ "Nikon Rangefinder SP Black 2005". 5 April 2009. Retrieved 2010-02-05. ^ "Nikon Compact cameras, by Nikon". Imaging.nikon.com. Archived from the original on 2009-05-01. Retrieved 2010-09-09. ^ Nikonos underwater camera models. Mir.com.my. Retrieved on 2013-07-26. ^ "Nikon announces Nikon 1 system with V1 small sensor mirrorless camera". Retrieved 30 December 2016. ^ "Digital SLR camera Nikon D4". Nikon Corporation. January 6, 2012. Retrieved 2012-01-07. ^ "Nikon D300". Nikon UK. Retrieved 2008-01-17. ^ "Nikon D750". Bright Side of News*. Retrieved 2014-09-13. ^ "Development Of Digital SLR Camera Nikon D850". Retrieved July 26, 2017. ^ "Nikon D90". Nikon Corporation. August 27, 2008. Archived from the original on February 24, 2011. Retrieved 2011-03-10. ^ "Digital-SLR camera Nikon D7000". Nikon Corporation. September 15, 2010. Archived from the original on September 18, 2010. Retrieved 2010-09-16. ^ "Digital SLR camera D7100 Wireless Remote Controller WR-1". Nikon Corporation. February 21, 2013. Retrieved 2015-06-02. ^ "Nikon D7100". Nikon USA. Retrieved 2018-09-08. ^ a b "Nikon Global DSLR lineup". Nikon Corporation. Retrieved 2018-09-08. ^ "Digital SLR Camera D7200 ME-W1 Wireless Microphone". Nikon Corporation. March 2, 2015. Retrieved 2015-06-02. ^ "The New Nikon D7500: Superior Performance That Drives The Desire To Create". www.nikonusa.com. Retrieved 2017-04-12. ^ a b "Product Archive". Digital SLR Cameras products line-up. Nikon Corporation. August 28, 2017. Retrieved 2017-05-28. ^ "Nikon D3100". Digital SLR Cameras products line-up. Nikon Corporation. August 19, 2010. Retrieved 2010-08-19. ^ "Nikon D3300 (USA)". Nikon USA. Retrieved 2018-09-08. ^ "D3500 press release". Nikon USA. Retrieved 2018-09-05. ^ "35mm Film Scanner (LS-3500)". Imaging.nikon.com. Retrieved 2014-04-30. ^ "35mm Film Scanner COOLSCAN (LS-10)". Imaging.nikon.com. Retrieved 2010-11-09. ^ "35mm Film Scanner (LS-3510AF)". Imaging.nikon.com. Retrieved 2014-04-30. ^ "Nikon | Digital Archives on Camera Products | Multi-Format Film Scanner LS-4500AF". Imaging.nikon.com. Retrieved 2012-09-21. ^ "Nikon | Digital Archives on Camera Products | 35mm Film Scanner SUPER COOLSCAN LS-1000". Imaging.nikon.com. Retrieved 2010-11-09. ^ "Nikon | Digital Archives on Camera Products | 35mm Film Scanner COOLSCAN II (LS-20)". Imaging.nikon.com. Retrieved 2010-11-09. 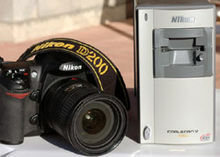 ^ "Nikon | Digital Archives on Camera Products | SUPER COOLSCAN 2000 (LS-2000)". Imaging.nikon.com. Retrieved 2010-11-09. ^ "Nikon | Digital Archives on Camera Products | COOLSCAN III (LS-30)". Imaging.nikon.com. Retrieved 2010-11-09. ^ "Nikon | Digital Archives on Camera Products | COOLSCAN IV ED (LS-40 ED)". Imaging.nikon.com. Retrieved 2010-11-09. ^ "Nikon | Digital Archives on Camera Products | SUPER COOLSCAN 4000 ED (LS-4000 ED)". Imaging.nikon.com. Retrieved 2010-11-09. ^ "Nikon | Digital Archives on Camera Products | SUPER COOLSCAN 8000 ED (LS-8000 ED)". Imaging.nikon.com. Retrieved 2010-11-09. ^ "History of Nikon Metrology". Nikon Metrology. ^ "X-ray and CT Inspections". Nikon. ^ "Large Volume Inspection". Nikon. ^ "Software for CNC Video Measuring Systems". Nikon. ^ "Software for 3D Metrology". Nikon. ^ "Nikon Laser Rangefinder". 27 September 2016. ^ "Nikon annual report 2008" (PDF) (Press release). Nikon Corporation. Retrieved 2010-02-05. ^ "Trademarks". Nikon Corporation. 6 November 2009. Archived from the original on 5 February 2010. Retrieved 2010-02-05. ^ "Kodachrome Lyrics". lyricsfreak.com. Retrieved 10 November 2012. ^ "Trivia for The Most Beautiful". ^ "India's Most Trusted Brands 2014". Trust Research Advisory. Archived from the original on May 2, 2015. Look up Nikon choir in Wiktionary, the free dictionary. Wikimedia Commons has media related to Nikon.